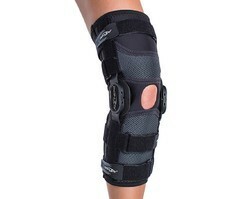 Providing you the best range of donjoy brace, osteoarthritis knee brace, donjoy oa web reaction knee brace, donjoy ligament knee brace, ligament brace and donjoy 4titude knee brace with effective & timely delivery. 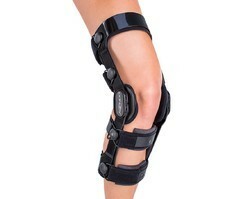 Donjoy OA Web Reaction is a knee brace ideal for patients suffering from mild Osteoarthritis. OA Web Reaction's Medical Grade Silicone web technology absorbs the shock from knee which relives patients from knee pains & swelling. Its light weight design makes the product easy to wear. The patented, integrated silicone condyle pad provides offloading of knee with a non-slip effect. To know your size, contact us today. 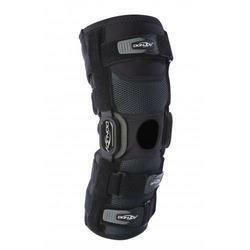 Donjoy Drytex Hinged Knee Brace supplier, trader, wholesaler, dealer, stockiest, retailer, stock holder, distributor. Donjoy Deluxe Hinged Knee Brace is ideal for moderate to severe ACL and/or PCL, LCL & MCL ligament instabilities for active, sedentary & adolescent patients. Product is also ideal for athletes for non-contact sports like Cricket, Tennis, Squash etc. Donjoy 4Titude is famous for its low profile & light weight designs then regular ligament braces. Its patented 4 points of leverage is clinically tested. Playmaker 2 is a well known product for ACL Ligamant tear & instability. We are considered as the well recognized suppliers and traders of Donjoy & Aircast Braces. Donjoy 4Titude is an ideal product for patients suffering ACL and/or PCL, LCL & MCL injury or instability. Helps patient for daily activities. Clinically proven 4-points-of leverage design maximises ligamanet protection. 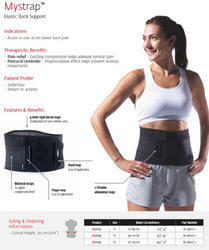 Donjoy MyStrap from Donjoy is an Elastic Back Support for Acute or Sub-Acute lower back pain. Donjoy Playmaker II Knee Brace With Patella Donut is suitable for mild ACL, MCL and LCL instabilities. It provides the stability needed and comfort required to empower movement to halted activity levels caused by even mild ligament strains. 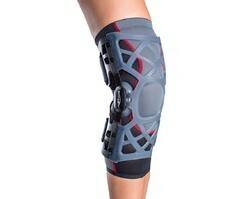 The knee brace is enhanced with Hi10TM (high tenacity nylon/spandex fabric) offering an unmatched comfort and fit. The advanced spacer fabric on the front and back promotes a cool environment for activities on all levels. This brace continues the use of DonJoys proven DIII hinge bringing a custom design to manage ROM options. Molded strap tabs allow for quick and easy adjustments to deliver a secure, comfortable fit. Donjoy Leg Bracesupplier, trader, wholesaler, dealer, stockiest, retailer, stock holder, distributor. We are one of the Leading manufacturer and supplier of Playmaker 2 Knee Brace, providing finest quality products. 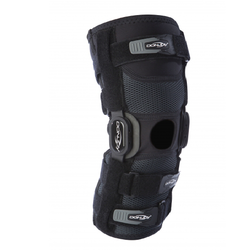 We are one of the Leading manufacturer and supplier of Donjoy Knee Brace. We are enlisted as the leading manufacturer, supplier, trader and retailer of good quality Knee Brace. The Oa Reaction Web Is Also A Solution For Individuals Suffering From Obesity. The Ultra-Comfortable Silicone Webbing Provides Shock Absorption And Anterior Knee Pain Relief, Treating Oa Of Both The Knee Joint And The Patella. Donjoy Oa Knee Brace supplier, exporter, trader, wholesaler, dealer, stockiest, retailer, stock holder, distributor. Better Braces Donjoy is a unique and effective way to treat osteoarthritis knee pain utilizing patented silicone web technology. The easy to wear open framework is designed for a comfortable, non-slip fit. Donjoy Mcl Knee Brace is a unique and effective way to treat osteoarthritis knee pain utilizing patented silicone web technology. The easy to wear open framework is designed for a comfortable, non-slip fit.